The masterpiece is the first known work by Rembrandt that’s joining a public collection in the Gulf region…. The Louvre Abu Dhabi is now home to a new rare oil sketch known as, Head of a young man, with clasped hands: Study of the figure of Christ from around 1648 – 1656. It was painted by the late Rembrandt van Rijn, one of the most celebrated artists of the Dutch Golden Age. 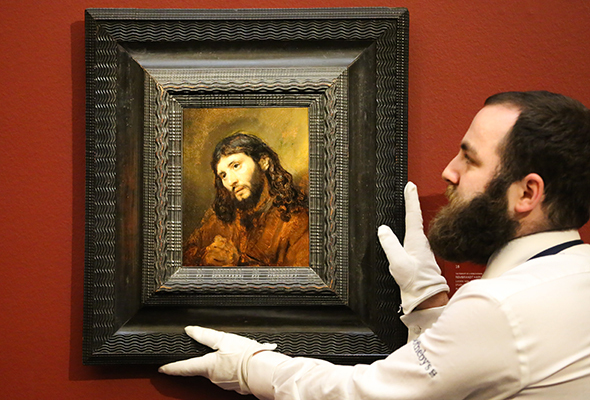 The painting belongs to a series of oil sketches referred to as Rembrandt’s Face of Jesus group and was purchased by Louvre Abu Dhabi back in December. The oil sketch will be a part of Louvre Abu Dhabi’s permanent collection, but will make its first appearance at Louvre Abu Dhabi at the Rembrandt, Vermeer & the Dutch Golden Age: Masterpieces from The Leiden Collection and the Musée du Louvre exhibition from February 14 to May 18. It will join 16 other remarkable paintings done by the artist, as well as other rare pieces by Johannes Vermeer, Jan Lievens and Carel Fabritius – all works of art done during the Dutch Golden Age during the 17th century. You can find out more about tickets to see this exhibition here. The exhibition will be the first international exhibition of 2019 and is in keeping with the celebration of the Year of Tolerance.